Fish baked in a salt crust is a simple and excellent way to cook it, provided it is fresh. 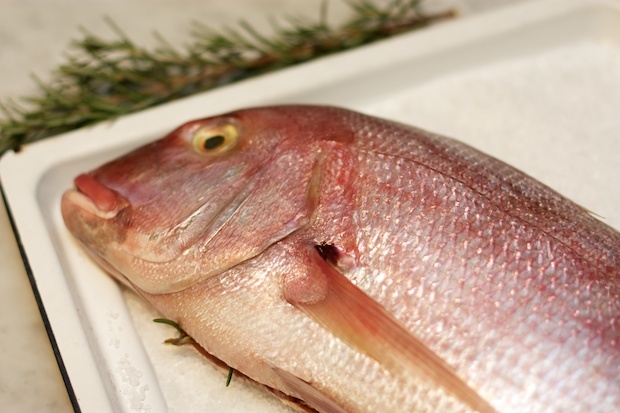 This preparation is suitable for sea bream, sea bass (or bass), red snapper but also a simple trout and in general the whole fish or tropical fish such as “red snapper” that is very popular in the USA. My brother-in-law Attilio is very good at cooking fish and loves to serve it with ginger sauce. I find it a delicious combination. The preparation is very light and it is suitable for fine dining with guests or for a romantic dinner for two. This dish goes well with thyme potatoes, cut thin, seasoned with salt and pepper and sprigs of thyme, a little olive oil. Place them in the oven in a single layer, cook it simultaneously with the bass (the oven should be ventilated). Wash the fish and dry it thoroughly even within the belly. This is very important because it prevents the fish from absorbing too much salt. Place the rosemary in the belly. Place a sheet of parchment paper on a baking tray and pour in half the salt. Place the fish on top and try to overlap the edges of the opening of the belly so the salt does not get in. Cover with the remaining salt. Bake at 400F degrees for about 50 minutes. Prepare the sauce in a bowl emulsifying the oil with ginger and add a pinch of salt. Remove the salt with a spoon covering the fish creating a space around the fish. Remove the skin and serve in individual portions cleaned of any scales. Over each serving drizzle a little ginger sauce.